I just want to thank you for an excellent presentation on Monday. You were fantastic – both educational and hilarious! Have you ever thought of stand up comedy when you’re not helping people organize? You received rave reviews, as I’m sure you know. Did we have enough of your books? I know people were buying them even before you had finished your talk. Thanks again, Regina, for a delightful program! Mary was here this morning and worked her magic. I watched her move thru 27 years of paperwork with the ease of someone cutting thru a stick of butter with a warm knife. Her ability to assess, sort, categorize and find logical places to file things provides me with a clear path to move forward. Mary was absolutely wonderful. I had always been so stressed about moving, and she made the process very easy. She was nice, understanding, and efficient. Professional, caring and fast. Ninja like ability with organizing!! Super impressive group of women…and fun too! I’ve worked with the Clear Path team multiple times and they are always fantastic. They are focused and hardworking and really get things done. In regard to Regina Lark’s services via “A Clear Path”, I most definitely would recommend her to anyone, especially of immediate need, like myself of clearing out and moving while pregnant, to aid in, logistically and critically, deciding to rid the unnecessary. She has an easy-to-understand and work-from book that I had read before hand that gives gentle understandings of and as to why we keep all the various possessions that we have. I, absolutely, could not have felt comfortable in doing the move until she and her amazing, professional as well as kind employees had helped me in, literally, clearing the path, so I could see what I really needed to work from there and rid myself of the trash, (thankfully with them helping to carry items, as I cannot at this time, and delivered to the Good Will). Of course, we (the owner of the items), have to make the final decision on whether to keep, donate or throw away, so with this being said, we cannot expect Regina will know the answer. She, however, will keep you moving at a fast pace and not wasting time because she really is good at what she does to help physically and psychologically, and knows your paying the big bucks for this aid. Lastly, I would like to say that my mind is much more clear and I have had the room for creative growth in business and my two children’s lives only after Regina’s services. I hope that people feel inclined to retain Regina for her services if they need the help. I called Regina Lark to help organize a really cluttered area of my house. She was a amazing! She asked about my goals for the space – what did I want it to look like after it was clear? and then created the strategy to do the work and we got started. I made 100s of decisions that day about what to do with all my STUFF and it wasn’t long before I could see that we making a lot of progress. no matter what issue bars you from obtaining the organized life you desire, Regina gets to the heart of the matter with a jovial approach which makes organization fun. among many other incredible traits… Regina is dedicated, witty, non-judgmental, and kind. exactly the type of individual you’d want on hand when navigating a ‘closet purge’. Regina talks you through all of your decisions. she asked a lot of questions about my relationship to my “stuff” and because of that I was able to pay forward a lot of my stuff to Goodwill and Out of the Closet. Regina is truly a rare find, and i intend to keep her on standby for all of my organizational needs from this point forward. Both personally and on behalf of my colleagues, who’ve had to endure my mountains of paper for years, I want to acknowledge the recent on-site organizing service done with and for me in my office from Regina Lark, from A Clear Path. The positive comments I received from co-workers along with their astonished looks is something I’ll remember for a long time. I realized long ago that the only way to achieve the big change I wanted and needed to do was to sit down and work side by side with a professional organizer. Regina’s patience and expertise was truly impressive and I appreciated her valuable guidance. Regina truly showed me “A Clear Path.” I look forward to her return visit here, soon, to help our office create a new workable filing system. I had the privilege of meeting and working with Regina Lark from A CLEAR PATH, as she helped me to bring order from chaos. As a former Professional Organizer, I immediately observed the manner in which Regina worked; what she did; how she observed what needed to get done; prioritizing: what she decided was first on her list, and second and third. I watched as Regina’s magic overtook the room. First, she observed that there were nine electric coffee pots and said, “Do we really need all nine of these, or, perhaps, has your lifestyle changed wherein you no longer entertain over 100 people at one time?” I smiled, and said, “Let’s give away six coffee pots today.” And so began the process of my house losing weight: a lot of it. After the kitchen items were sorted, and separated, we moved onto the stacks and stacks of papers. Here, Regina assigned me the task of sorting through the garbage, filing, action items, etc. The trash pile kept growing, happily, and the other papers just seemed to fall into logical piles. I was impressed with Regina’s knowledge and implementation of her organizing style. She wow-ed me in so many ways, and I would recommend Regina to anyone who wants to get organized and stay organized forever. Regina Lark is like a gift from G_d. I was lucky enough to have her recommended to me after months of upsetting my boyfriend with all the clutter I kept in the house. Regina came and got to work immediately. She was extremely efficient and cut to the chase, which was essential for me as part of my clutter problem is the inability to let go and indecision. Within a few short hours, Regina helped me make quick decisions to get rid of items I didn’t need and organize what I decided to keep. 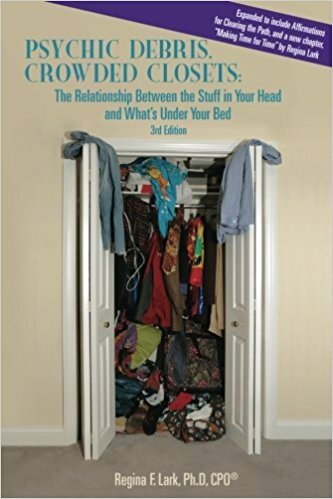 The lack of clutter in my house thereafter gave me and my boyfriend great piece of mind and removed unnecessary stress from our lives. I highly recommend Regina’s work! I am so pleased with my new de-cluttered closet! It is the best gift I could have given myself! Regina from “A Clear Path: Professional Organizing for Home, Work, Life” was a joy to work with. She is upbeat, on time, non-judgemental, and FAST! She worked with me to sort out my belongings into various categories such as keepers, throw outs, donates, and move elsewheres, and in a few hours it was done! Regina is a PHD in history and got her organizing skills from categorizing bits of information for her thesis. She was recently written up in a Wall Street Journal article reviewing professional organizers around the country, and she was one of the best! In addition to organizing closets, garages, and homes in general, Regina also de-clutters offices and businesses, and is a life coach. Many thanks to Regina Lark and A Clear Path for helping us clear space and save money in unnecessary storage fees. With our impending move and office reorganization, we decided to hire A Clear Path rather than putting everything in boxes and sending them to storage. Regina helped us get rid of boxes and boxes of paper and other clutter we did not need, and advised us on a system for keeping our offices clutter-free. Since our work with Regina, our staff have become more productive, and are now working in an environment that is consistently clean and organized. Because our offices are more pleasant to work in now, employee morale has even improved – a nice side benefit to the service!